Footballs signed by Brazilian legends including Pelé, Ronaldo and Romário transformed into artworks to celebrate Brazilian World Cup and raise vital funds for charity. Art and Sport collide this summer for ABC Trust Art of Futebol, with footballs signed by some of the biggest stars of Brazilian and British football transformed into unique works of art by some of the most exciting contemporary artists working today including Rob & Nick Carter, Patrick Hughes, Pure Evil, Pakpoom Silaphan and Cibelle. The balls will be displayed in the World Cup Walkway at Selfridges on 23rd June until 9th July on the LG Floor. On 10th July the balls will be auctioned off in a private event at the Brazilian embassy by a celebrity host and professional auctioneer. Proceeds from the auction will go to Action for Brazil’s Children Trust (ABC Trust), which supports grassroots community projects to transform the lives of the most vulnerable kids in Brazil. The dream teams of footballers and artists are; David Luiz and Inkie; Falcao and Pakpoom Silaphan; Neymar and Richie Culver; Oscar and Tolleck Winner; Romário and Cibelle; Pelé and Rob & Nick Carter; Raí and Pure Evil; Ronaldo and Nasser Azam; Ronaldinho and Patrick Hughes; Ramirez and Jimmy Galvin; and Zico and STATIC. ABC Trust works to ensure every child has the right to, and the reality of, a safe childhood, a good education and opportunities to reach his or her potential. They use sport and art through local community projects to protect and empower at risk children and young people and provide them with positive role models. Patrons of ABC Trust include; Pelé, Brian May CBE, Jeremy Irons, Carlos Miele, City of God Director Fernando Meirelles, artist Romero Britto, musician Bebel Gilberto and musician Julian Lloyd Webber. “I hope for the days when people all over the world will use the same passion they have for football, to channel it for change, for equality, for helping those in need. May these footballs become a symbol of co-creation. It’s a simple act,one player signs,and an artist puts their materials onto it in an act of co-creation, both apply their art onto the same object and charge it with intent. I take the players intent on winning the game placed on the ball at play, and add charge to it with intent for love winning over hate, with equality being championed all over the world. It will win. It was an easy choice saying yes to this, from an Artistic point of view it was a good challenge working on a football, from a personal point of view as a massive Football fan to collaborate with Neymar Jr also is great. Lastly and most importantly was the charity aspect: ABC Trust. Hopefully we can raise some good money to help the more vulnerable kids from Brazil to ensure they get a fair chance in life. This unique project was conceived by Action for Brazil’s Children Trust supporter and Sports Media Consultant Betise Head, ABC Trust Founder Jimena Paratcha, and Alice Whitney of Creative Nation, with the help of Lee Sharrock, an arts PR, curator, writer and Director of Global Creative PR at Saatchi & Saatchi Worldwide. Our vision – A Brazil in which every child has the right to, and the reality of, a safe childhood, a good education and opportunities to reach his or her potential. Our mission – To protect and empower at risk children and young people through providing local community services and positive role models in their lives. By raising awareness and funding ABC Trust supports the work of local, community-led organisations, which give children, their families and communities the education, support and inspiration that they need to transform their lives. Our projects are based in the large urban centres of Rio, Sao Paulo, Recife, Salvador and Fortaleza. Born and raised in Sao Paulo, Brazil, inter-disciplinary multi-practice performance artist Cibelle Cavalli Bastos has been based in London for 12 years. She was educated at the Royal College of Arts and l’Ecole Superieure de Beaux Arts in Paris. Cibelle has been a singer, composer and music producer for 14 years, with 4 albums released worldwide. From a very young she age lived among paint brushes, clays and musical instruments. She studied music at the conservatory Marcelo Tupinambá where fine arts were also taught. 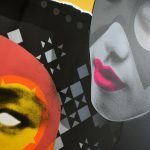 In 2008 Cibelle started to collaborate with FUR.co.uk and also in 2008 she participated with the collective “assume vivid astro focus” at the 28th Biennial of Sao Paulo. In 2009 she participated in the poetry marathon of the Serpentine Gallery alongside Guggenheim’s Latin American art curator Pablo Leon de la Barra and Kenneth Bostock. Inkie is a London based painter and street artist, originally from Bristol. His pieces incorporate styles from diverse sources, such as Mayan architecture, the work of William Morris and Islamic geometry. 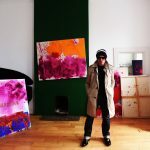 Having chosen to only outsource his work through established members of the Fine Art Guild, his pieces have seen demand increase by 10 times in value, with his work collected across Japan, China and America and by celebrities including Jade Jagger, Robbie Williams and Fatboy Slim. Nasser Azam (b. 1963, Jhelum, Pakistan) is a London-based British contemporary artist. works in London. His paintings portray the human figure encoded in bio-morphic forms and gestural marks, and typically use a restricted palette. His sculptural works include the monumental bronze sculptures The Dance at London’s South Bank, Evolutionary Loop 517 at the University of Aberdeen and Athena in the London City Airport, which at 12 metres is the tallest bronze sculpture in the UK. Azam has developed his painting in a series of projects that reflect his interest in extreme working conditions and also painting as a performance, from Zero Gravity (Star City, Moscow, 2008), to the freezing ice deserts of Antarctica (2010). My Private Collection with Grayson Perry, David Hockney and Banksy at the Paul Smith Gallery in Tokyo in 2009. Patrick Hughes is the creator of ‘reverspective’, an optical illusion on a 3-dimensional surface, which makes close objects appear farthest away. Hughes’ painted reliefs baffle his audience, demonstrating how deceptive appearances can be. As one walks towards the seemingly flat paintings they instead loom out, creating a disorientating, ‘moving’ experience. He is represented by Flowers Gallery and his work has been shown in London, New York, Santa Monica, Seoul, Chicago, Munich and Toronto. Charles Uzzell-Edwards is a graffiti artist known by the moniker “Pure Evil”. After studying fashion and graphics in London, he worked for clothing label Anarchic Adjustment in California with Alan Brown and Nick Philip. Pure Evil uses stencils, spray paint, acrylic, marker pen, glow in the dark paint, neon and tempera pain. In May 2012, he appeared on the BBC TV show The Apprentice, where he took part in an urban art task. Key exhibitions include The Nightmare Series at the Saatchi Gallery, 2014, and Pure Evil Nightmare at The Hoxton, 2013. Richie Culver was born in Yorkshire but moved to London in 2000, where he created his first work: a magazine cut-out of a Jesse Owens photo accompanied by the words: ‘Have you ever really loved anyone?’ Despite his lack of formal training, the piece was immediately featured in a group exhibition at Tate Modern. Since then Richie has been experimenting with photography, mixed-media installations, paintings and collages and key exhibitions include The Four Letter Word at Skur 2 Gallery, Norway, 2013. Rob and Nick Carter are a married couple who have been working together for over 15 years. Their work focuses on the possibilities of light, colour and form and has taken many mediums including camera-less photography, painting, installation, neon, sculpture and time based media. Their work constantly questions the boundaries between each media, often creating works which cannot be defined in one sense alone. They have executed several large scale public and corporate commissions throughout London including works for Great Ormond Street Hospital, 200 Aldersgate and Saville Row. Their work is in collections of the Mauritshuis, the Frans Hals Museum, the Victoria and Albert Museum, the David Roberts Foundation and the Royal Bank of Scotland. STATIC is the creative collective of London-based artists Tom Jackson and Craig Evans. 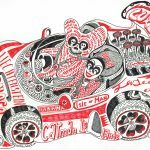 Their work is best known for its graphic and patterned style, created through screen- printing and mixed media techniques. STATIC often use found objects and symbols to signify modern culture, choosing to apply their work to surfaces such as wood, glass, Perspex and metal. 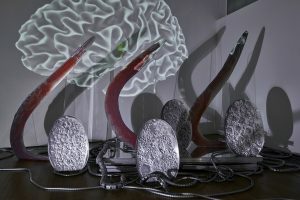 Their work has been exhibited in the UK, Italy, Singapore, the US, India and Japan, and a selection of pieces from their Phantasms of the Living exhibition were added to the private art collection of the Saudi Arabian Royal Family. Tolleck Winner ARBS was born in the former USSR in 1959. He has lived and worked in the United Kingdom since 1980. Dedicated to producing art as full time occupation, his work is kept in private and public collections in the UK and throughout the world. Tolleck’s art stems from his early fascination with the basic nature of raw materials. His work aims to extract values from the basic elements of nature, largely working with metals, minerals and rocks. Experimenting with various materials he has mastered a unique technique based on proper engineering studies. Tolleck Winner has been involved in many solo and group exhibitions in the UK and overseas. His latest solo shows; ‘Beyond the Big Bang’eand ‘Vanitas’aheld at the Alon Zakaim Fine Art, London in October 2006 and 2007 strengthened his position as a well recognized and established contemporary artist. This entry was posted in NEWS and tagged Cibelle, David Luiz and Inkie; Falcao and Pakpoom Silaphan; Neymar and Richie Culver; Oscar and Toll Romário, Jimmy Galvin, Nasser Azam, Pakpoom Silaphan, Patrick Hughes, Pelé, Pure Evil, Raí, Ramirez, Rob & Nick Carter, Ronaldinho, Ronaldo, Static, Zico. Bookmark the permalink.